Being a friend of Gary’s I had seen a lot of his material before and was greatly looking forward to his lecture. First things first, the lecture was incredible. Lots of sensational material covered and shown. It was also one of the biggest ever turn-outs at the Plymouth Magic Circle, even surpassing some BIG names in magic. 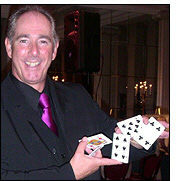 Gary started the evening with his Table Magic opener ‘Starter for ten’, which is a great effect and perfect for the restaurant magician, where a notepad instantly turns into a deck of cards. I had seen this before when Gary first came up with the idea, but he had several new ideas and improvements which made the effect so much better. As a bonus, this effect came free with Gary’s Lecture notes. Then Gary performed his Cards to Pocket routine. Every time Gary has shown me the routine he has fooled me, and when he performed it tonight, I almost wanted to leave the room whilst he explained it as it would ruin the magic for me. However I was glad he taught it, as it is now definitely a keeper for me, one of the best, if not THE best Cards to Pocket I have seen, and worth the price of the lecture alone in my opinion. A borrowed finger ring is placed onto a large safety pin which is marked with a Sharpie. Then another large safety pin is shown. Then slowly and incredibly, the ring melts from the marked pin to the unmarked pin. It really does look like the ring melts from one to the other. This is must see! Several other effects were covered before the mid-time break including his self working 3 card prediction effect that is a real stunner and again is another keeper for me. It floored the room full of magicians. Also Gary showed his colour changing silk routine which again was flawless (and didn’t use a dye tube!). Gary also performed one of the best 3 Fly routines I have ever seen. Most people who know me know that I love 3 Fly, and to see this routine was just a joy to watch. The coins appear, travel across from hand to hand and then vanish one at a time, leaving the magician with completely empty hands (and sleeves!!!). Also performed and explained in great detail was Gary’s Coins Across with a kicker ending which again caught the whole room out! And in the second half, more incredible magic was performed. One of the most notable was Gary’s completely impromptu FASDIU Thought of Cards Across. In my opinion, and many others, this is THE Ultimate Thought of Cards Across. I don’t want to divulge too much as it would spoil it for when you watch it, just trust me, prepare to be blown away! A stunning mind reading effect with a small box and coins from all around the world was next, where a chosen coin was predicted beforehand. I now have a use for an un-used prop! Also one of the best and easiest Sandwich effects was shown and taught. A two phase routine that is so simple, yet incredibly striking to the audience. There were several other effects shown, however I won’t divulge them; there were other parts that need a mention. For a start, Gary is an incredibly funny guy. You cannot help but enjoy his routining and patter, and one lesson that Gary did a great job of teaching was misdirection. How to make people look where he wants when he needs to, and I learned many useful tips that I will now use. The other great thing from Gary’s lecture was his Top points. About 12-14 points that Gary brought up on key cards that he explained and demonstrated when necessary. The points went over almost every topic in close-up magic and table hopping that you could want to know. There were many great tips that many people will walk away happy with, and will only improve people's magic. Gary also performed a couple of his marketed effects, and shared several ideas for other routines. After the lecture had finished, Gary sold out of ALL his lecture notes, and sold out of pretty much everything else I saw on his stand. I hadn’t seen things sell so quickly at a lecture in my life! All I can do is say well done to Gary for a sensational lecture, and definitely a lecture not to be missed. If he is in your area, or even if he isn’t, make sure you see it!